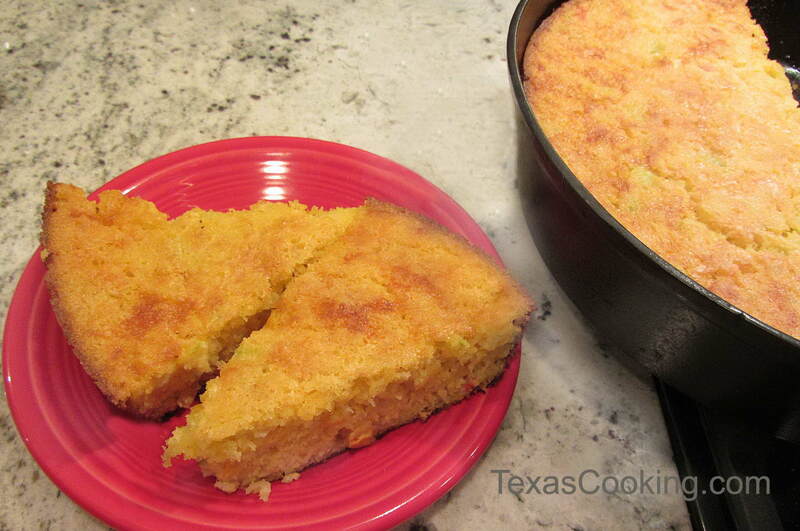 Green chiles, some onion, cheese and pimientos make this a really good cornbread. In a medium bowl, beat the eggs, oil and buttermilk until well blended. Add the chiles, creamed corn, pimientos, onion and sour cream. In a separate, large bowl, combine the cornmeal, flour, salt, soda, baking powder, and cheese. Stir until thoroughly blended. Add the dry ingredients all at once to the egg and buttermilk mixture, stirring just enough to blend everything. Pour batter into a well-greased 10-inch cast iron skillet or pan. Bake at 350°F for 30 to 40 minutes or until slightly brown and springs back at the touch. Note: Take our virtual Cornbread Seminar and learn about cornbread and its many varieties.